Wednesday saw both KLCI & FKLI rebounded to close the day on high note. Price is trapped between two support levels of 1,616 & 1,634. Basically running sideways flat within 1630-32 range whole afternoon session. Given the low momentum price movement throughout the day, I will take the bullish engufling candle by close with a pinch of salt. I'm more inclined to believe its some short covering & technical rebound rather than buyers eagerly finishing the bottom. Two consecutive days of failing to breach the overhead resistance of 1,634 also indicates the bears are still in control of the game. Besides, momentum indicators continue their weakness, while volume lacks big time, below its 5d average. All in all, an up day with no essence of bullishness. The overnight bullish close on US market saw major indices at their 5year high. Good news from the U.S. House approval on a suspension of the debt ceiling until May 19 help lifted the DJI. The suspension will allow the US government to continue to pay its bills and temporarily putting off a bigger fight over taxes and spending. A two-month window will give the two parties more time to seek a long-term deal that has proven elusive. This may help lift our KLCI tomorrow, or not. Anyway, let's see if volume shall pick up tomorrow & confirms the bullish engulfing candle with a higher close. Nonetheless, the long weekend ahead shall deter trading activities tomorrow. CPO price continued its way up along the short-term uptrend line. Did a healthy pullback to 2,450 in the morning, then zoomed back up to high of 2,484 right after the afternoon session opens. 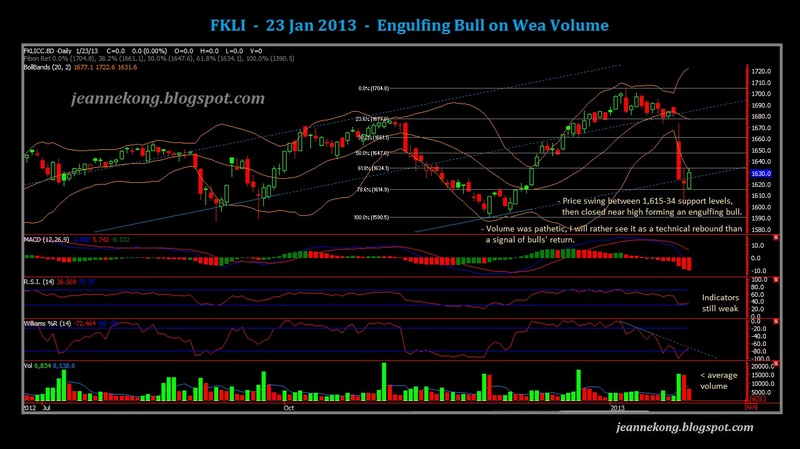 Price then settled at 2,479 with mild profit-taking to avoid holding positions over the exchange holiday on Jan24. Volume is seen picking up over the past few days, which works out well for the upward price movement. Overhead resistance still lies at 2,500-2,520 level, followed by 2,600 psychological level. Support shall comes in at 2,470 | 2,440-50 level. Today (Jan 24) saw SoyOil price dropping sharply, covered the gap on Jan22 at 51.70cents. 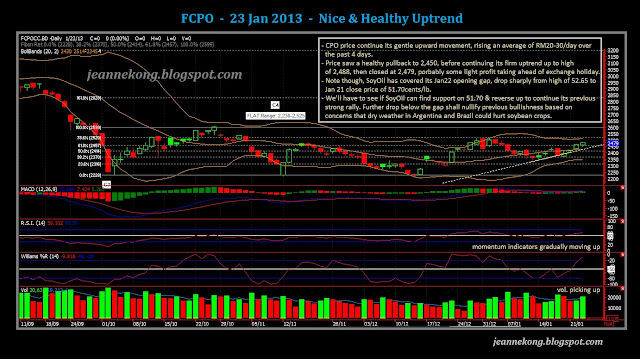 As of writing (Jan 24, 2045h), price has dropped below 51.70cents, with immediate support seen around 51.40cents. When BMD CPO futures market closed yesterday, SoyOil was near its recent high of 52.65cents/lb. That works out to about 1cents difference from current price. This drop does not augurs well on the CPO uptrend. We'll have to see if SoyOil will reverse its drop overnight, before CPO opens for Friday's trading.